Brandon Jones, Amanda Berry, Bethany Geraghty, Chris Kipiniak and Gregory James Cohan in In The Soundless Awe. BOTTOM LINE: An intricate attempt to humanize a tragic wound in U.S.'s naval history. A country's history is made up of its successes and its failures. The former, usually kept in people's minds and hearts for longer than the latter, serves as fodder for the construction of national identity and helps place a nation in the global historical picture, allowing for political leverage. The latter, if at all, is strategically brought up to humble the nation and give its people a sense of vulnerability, hanging over their heads as a constant cloud of shame. What would happen though if said cloud were to be dissipated, allowing the sun to shine again on the subjects of said failure? This is a question answered by In The Soundless Awe. Here, what is known to be one of the most tragic chapters in U.S. Naval history—the sinking of the U.S.S. 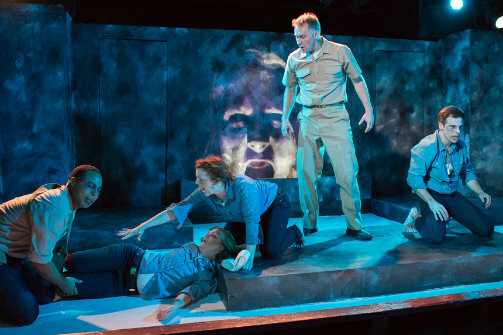 Indianapolis during WWII by two Japanese torpedoes after the ship was lead into apparently safe waters by Captain Charles Butler McVay III—has its final moments reimagined under a very theatrical and emotional light. With a successful marriage of lyricism with a symbolic and effective use of lighting designed by Michael O'Connor, illustrative sound design by Andy Evan Cohen, and haunting video design by Yuriy Pavlish and Zach Griffin. In The Soundless Awe questions the martial logic under which McVay was tried presenting it as unjust, cold, and quasi-illogical (a point made by the use of the testimonial of the Japanese official who fired the torpedoes that brought the ship down to corroborate the case against Captain McVay's innocence). McVay is played by Leo Farley in his past moments and by Chris Kipiniak in the present. Farley anoints the character with an infant-like innocence, delivering a believable performance of a man who has complete faith in his duty and love for his country. Kipiniak, though only appearing at the very beginning and the very end of the play, embodies with precision the figure of a man haunted by life and clings to the belief in his choices in the hopes they'll appease the shame of their consequences. Hallie Wage appears as the Gray Lady, personifying at times McVay's nightmares, at times the judge in his dreams and at times a sea messenger for death and darkness. Wage moves smoothly and adds charm and mystery to the face of doom. The show ends on a high note, with a patriotic homage to Captain Charles McVay III as the ensemble salutes the heavily condemned historical figure while marching to Sigur Ros's melancholic and touching "Glósóli" to black and white images of the real survivors and the real Captain projected on the background. While I—a foreigner with very specific opinions about the U.S. military procedures and approach to world politics—wasn't particularly moved by the salutation ritual, I can understand why others might leave the theatre feeling gratitude to this talented group of sensitive artists. In The Soundless Awe also appears at a crucial moment in the world's history and questions, albeit lightly, the logic behind war, patriotism and the double standard of a country that values their youth before the war and then turns its back on them after they've served. Definitely a discussion that needs to happen. In The Soundless Awe is written by Jayme McGhan and Andy Peterson and directed by Sarah Norris. Choreography by Corrie Blissit. Associate director is Abby Wylan. Set and props design by Brian Dudkiewicz. Costume design by Genevieve V. Beller. Lighting design by Michael O'Connor. Sound design by Andy Evan Cohen. Projections design by Yuriy Pavlish. Film consulting and video editing by Zach Griffin. Make-up design by Nicole Ferrigno. Production managed by Joshua Shain. Technical direction by Matt Vieira. Associate scenic design by Samantha Schaffer. Production assistance by Joy Yoo. Production stage manager is Juni Li. It features Amanda Berry, Gregory James Cohan, Eric Cotti, Leo Farley, Bethany Geraghty, Brandon Jones, Chris Kipiniak, Janae Mitchell and Hallie Wage.